Netflix in Africa? ‘I couldn’t possibly comment’. There’s been a lot of excitement about the arrival of Netflix around the world last week and nowhere has that enthusiasm been more pronounced than in some of Africa’s biggest cities. The streaming service is now available in all 54 African countries. The social media-enabled global consumer in Accra or Nairobi wants to be able to see some of Hollywood’s popular shows at the same time as their friends in the United States or Europe. Even more are excited about Netflix’s range of original and licensed TV shows and movies. But, as the cliche goes, not so fast. In fact, many people are likely to find themselves Netflix and buffering rather than chilling. The California-based company will face different challenges across various African markets, but they’ll have two big things in common in most countries: spotty internet connectivity and pricey data plans. But Netflix has a plan. The company has developed video compression technology which allows it to deliver shows, movies, and documentaries even over slow connections. Chief executive Reed Hastings was particularly bullish about the technology when he announced the global roll-out at the Consumer Electronics Show in Las Vegas last week. The adaptive streaming technology works by caching content on servers worldwide wherever its ISP partners have wanted it, Hastings explained. It has helped deliver more than 125 million hours of video every day in over 60 countries, the executive said. The problem, you might notice if you look at the screen grab below is that there are currently no servers in sub-Saharan Africa or India, another major new market. Reed Hastings, CEO Netflix at CES. Red spots mark server locations globally. 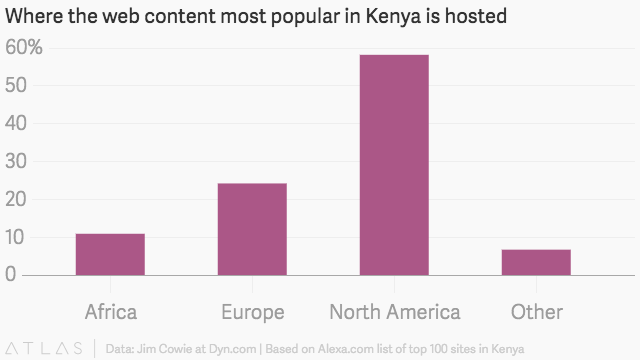 And, as we’ve written before, one of the key reasons popular websites—even those with local content—take so long to load wherever you are in Africa is because the content is often being loaded from servers in another continent. Netflix says it’s still trying to figure out its technical strategy for Africa but is expanding its global content delivery network. “It’s week one of our availability in Africa and indeed in many places around the world, and we will be learning about what’s working well (and what isn’t), and then improving as we go along,” said a Netflix spokesperson by email. Still, pricey data plans will be an issue. In Nigeria, for example, a 2 gigabyte data plan can cost as much as $20 per month. Regular viewing of Netflix will use several times that amount of data in a month. That’s a lot of money for data in a country where the average university graduate earns around $500 a month. Watching movies or TV shows on Netflix uses about 1 GB of data per hour for each stream of standard definition video, and up to 3 GB per hour for each stream of HD video. This can create headaches for Netflix members who have a monthly bandwidth or data cap on their Internet service. Despite these challenges, some African markets seem more ready for Netflix than others. At least, the consumers are ready. In Nigeria, smartphone subscriptions are rapidly growing and the number of internet users has trebled in three years. More importantly, Nigerians now consume more video content on their mobile devices than on television. Conversely, Kenyans still overwhelmingly watch on their television sets, not on their mobile phones, tablets or laptops, and few own smart TVs. There are also questions over what Netflix’s impact might be on local players in the streaming business. In South Africa, Naspers, which already dominates the TV market, has already stepped up its game. As a preemptive step to Netflix’s launch, Naspers launched ShowMax, an on-demand video service, last year.